Planning to do a little diving, snorkeling or just have fun with your action camera underwater? Then you’re going to want to make sure your camera is waterproof so you can catch your footage without fear of the water getting inside the camera and screwing it up. If you’re looking to buy a waterproof action camera, this short guide hopefully will point you in the right direction because I know there are many to choose from and it can be daunting to know exactly which one is going to be the best to buy. The last thing you want to happen is to go out and buy a camera that is supposed to be waterproof and then it turns out not to be like it said on the box. It will spoil all the fun if your camera dies, so be careful when choosing one as some don’t always live up to their descriptions. Beware of cheap cameras that advertise they are waterproof. More often than not, they don’t live up to their promise. They will “resist” water for a little while but after prolonged use (more than 5 minutes), they will lose their seal and water will seep in and you can say goodbye to your camera. The best advice I can give you to make certain that your camera will stay dry is to use a special waterproof case. This guarantees your camera will stay dry if you use it correctly. Even if some cameras advertise they are waterproof for up to 1 meter or 3 meters without the need for a case, always use a waterproof case anyway if you are going to be filming underwater for prolonged periods of time. If you just want to use your action camera for outdoor sports where it will only get a few splashes.. perhaps the odd dunk in water for a split second, you don’t really need the separate waterproof case. 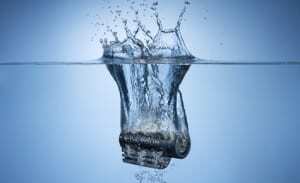 Nearly all good quality cameras will keep water out as long as it isn’t submerged for a long time. A waterproof case is only necessary when you are taking your camera underwater or it’s going to be in contact with water for a long time. Below are my top 3 recommendations and comparisons of waterproof action cameras that you can feel 100% confident in using deep down in the water. 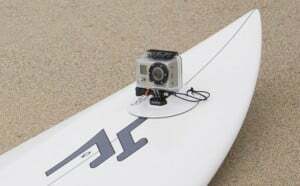 GoPro is the creator of the original waterproof HD action camera with it’s GoPro HD Surf HERO camera. The small GoPro camera is capable of recording HD video up to 1080p and has many other HD video options to choose from. It can also record at different frame rates (from 30 fps to 60 fps) so you can choose the quality of your video. Not only does the GoPro take brilliant HD video, it also takes sharp 5 MP still photos, along with “photo burst” sequences which you can set to 2, 5, 10, 30, or 60 second intervals. The great thing about the GoPro surf HERO is it comes with it’s very own waterproof housing with a depth Rating up to 180 feet / 60 meters (same as Contour ROAM). This is not extra to buy, this case comes with the GoPro SURF Hero. The Contour Roam is a new, robust and easy to use HD action camera from the Contour company. It is also waterproof to 1 meter for 30 minutes without a separate waterproof case! That’s quite an incredible claim, but I wouldn’t test it out. The Contour Roam provides you with all the basic features you’d want from an action camera. 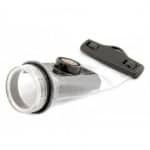 It can do HD up to 1080p, it’s small and light, has long battery life, it has a wide angle lens that you can rotate to get the picture right when you mount it, and it can keep water out when used with the waterproof case (sold separately). It’s a great camera if you’re just starting out because it’s very easy to use, doesn’t have all the extras to confuse you and the price is very, very reasonable. 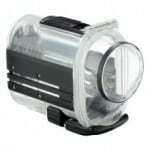 The waterproof case is sold separately and is factory rated to keep water out for 60 meters / 180 feet deep. 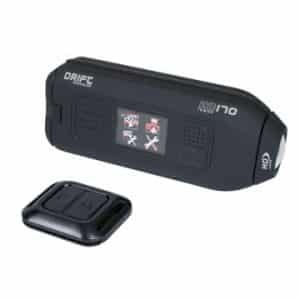 The Drift HD170 Stealth is a high-tech, yet easy to use action camera that redefined the standards when it came out early in 2011. It records in Full HD up to 1080p and other HD options in a range of frame rates (25 to 60 fps), is very rugged and has all the features you need to make professional videos of your extreme sports easily and quickly. Some of the unique features of the Drift HD170 Stealth include a built-in color LCD screen, remote control to switch recording on and off, a rotating 170 degree wide angle lens, durable and water, mud, snow, rain, resistant casing. This camera is for the avid action camera and extreme sports fan. As it is it’s only water resistant so it can stand splashes and drops into water but for prolonged use underwater, the waterproof case it essential. However, the rating for the waterproof case for this model is only 3 meters / 10 feet, so it’s not really suitable for deep diving but ok for swimming and snorkeling in shallow reefs etc. I hope this article has helped you to learn what to look out for when shopping for a waterproof action camera and has given you a good dea of how much a good, reliable one will cost. When you’re taking your camera underwater, you want to feel secure about it so go with a good quality one and you won’t have any problems.